Healthy weight loss starts with choosing the right foods to incorporate into your diet routine. How to diet with the fruit diet tips to make it happen. The fruit diet unlike single food diets based around one specific dish allows you to diversify you food intake that if done right can help you lose weight like many others can tell you it works. The principle that the fruit diet is built on is to synergize enzymes and minerals aiding in digestion and nutrient absorption to enhance your diet! The fact that fruits are low calorie is what makes them so attractive to anyone on a diet trying to lose weight. You may be thinking that since fruits contain a substantial amount of sugar eating too much is going to make you fat. That would be the case if fruits weren't low in calories. If you thought fruits were high in calories then think again. A 100 gram serving of fruit makes a difference of 300 calories before and after. However, practically speaking people don't eat more than 100 calories in one sitting. That just one more reason why you can eat all the fruit you want without getting fat, i.e. fruits are your friends. As for how the fruit diet works all you need to do is replace one meal a day with fruit preferably breakfast or lunch effectively cutting back on your daily food intake so you can eat like you want to in your 2 remaining meals. Do keep in mind that you want to restrain yourself from eating past 80 percent of what you think you can eat. The basic principle that the fruit diet is based upon is eating raw fruits. In raw fruits are dietary fibers, minerals, and enzymes and vitamins unique to fruit that are said to do wonders for your skin. In that respect, it is recommended that you avoid storage in a refrigerator and eat at normal temperatures to get full effect. What's wrong with eating ice cold fruit? Eating cold fruit lowers your body temperature affecting blood circulation. By eating fruit at normal temperature you benefit your diet not impeding or delaying blood flow in your body. Just getting started out on the fruit diet you may experience an unanswered appetite feeling hungry throughout the day. Getting through the drought of being hungry in the morning makes it easy to feel good eating what you want in your evening meals. While on the fruit diet you should stay away from drinking coffee and tea drinking water (or mineral water) to supplement the fluid intake you get from eating fruits. Start You Day Off With Breakfast Fruit! Going on the fruit diet is as easy as eating breakfast each day! Fruits are best eaten on an empty stomach. When eating fruit, digesting other foods for dieting do keep in mind that energy is burned off during the process of consumption and digestion. Know that eating fruit first thing in the morning lets you cleanse your system while still eating breakfast. Since the content of an ingredient changes with fruit, it is possible that the effects about a how-to diet also differ. The fruit that abundantly contains the dietary fiber makes the enteric environment clean, and a juicy fruit do working that sweeps up body wastes. Moreover, it is also a recommendation to take in fruit the whole skin. In fact, many ingredients to the skin are contained rather than flesh, and the ingredient "phytochemicals" is abundant also in it. Eating every skin means Ingredient to help prevent adult disease; phytochemicals is the prevention of lifestyle-related diseases and diet effect like "killing two birds with one stone"
If in the case of fruit breakfast, lunch, may have the fruit or fruit diet at night, daytime, it also varies from individual differences in body weight change only in the morning by an individual. Why fruit is suitable for the diet? Before introducing it, do you know the digestive time of fruit first? Fruit is very easily digestible food, and if you eat in the raw state, is like to which absorption will be performed about 20-40 minutes after digestion. It is with the time when absorption of the energy that from 12:00 p.m. to 20:00 p.m. took in for from 20:00 p.m. to 4:00 a.m. at the time when digestion of the food is performed is performed at the time when the excretion of a digested thing is carried out until from 4:00 a.m. to 12:00 p.m. Particularly, a dietary fiber is plentiful to excrete an unnecessary thing to the bodies such as waste materials in the morning, and good fruit of the digestion is recommended. Without placing a load on the stomach, is also in excellent condition throughout. Fruits for Good Skin and Hair Solving Cosmetics Problems! An apple, which contains large amounts of dietary fiber. The water-soluble dietary fiber called "pectin" also in it is very abundant. It is made hard for "pectin" to have a gell-ized function, and for salt, sugars, lipid, etc. to become gel, to wrap the glory element which can serve as bodily fat, and to take into the inside of the body. This pectin has more content of the peel than the flesh portion of an apple. The dietary fiber the "cellulose" which the dietary fiber contained in an apple can take in not only from pectin but from the usual meal is also contained. There is work which makes an intestinal environment good in the action which discharges a toxic substance to the outside of the body, and the action which stimulates an intestinal tract and improves constipation. The dietary fiber the "cellulose" which the dietary fiber contained in an apple can take in not only from pectin but from the usual meal is also contained. There is work which makes an intestinal environment good in the action which discharges a toxic substance to the outside of the body, and the action which stimulates an intestinal tract and improves constipation. Vitamin of fruit is not only taken in abundance, is also effective in beauty for a woman is a fruit diet recommendation. Including the phytochemicals, the fruit is good for the body other nutrients, vitamins, dietary fiber, carbohydrates, and minerals. Phytochemicals is suitable for anti-aging nutrients that have antioxidant properties, among others. Along with aging, it is rusted by active oxygen the inside of the body, and many spots and wrinkles will be produced. But does a woman hate it? I interfere with work of the active oxygen which is a cause to make stain / wrinkle, and the Phytochemicals is effective in raising immunity. Furthermore, it is a nutrient of expected by which expectation is carried out to lifestyle diseases prevention, such as cancer and Alzheimer's! Moreover, the fruit effect not only improves a bowel movement, but is expected from the improvement in the rate of lustrous skin. Characteristic enzyme is contained in fruit, and the enzyme collects and turns around a toxin in the living body. And since there is work of excreting and giving to the outside of the body, don't those whom a cosmetics side worries, such as a person of obstipation and those whom dry rough skin worries, you try once? To be sure, a fruit diet is wonderful as diet effects, such as loss in quantity, skin enhancement, etc. of weight. However, is the thing which needs the cautions which hit performing a fruit diet known? There is a point which it should be aware of in the large advantage of a how-to diet firmly. Although the effect of a fruit diet is based on an individual, also for those who become thin, so that it is interesting, in inside, maybe in large numbers beguilingly. However, the person that loss in quantity of the weight of a -5kg per month is seen has to slow down there. It is not good for health to become thin too much at once. Once, let's take the time to check abnormalities or problems with diet that you do not have to appear in the body. As a result of diet, the research have been reported about weight loss as a measure of the -2kg / month about is just good, while attention to the rapid weight loss of body weight, are going to a healthy diet. Some people have replaced two meals a fruit diet? "If all the meal is substituted for fruit, it will become thin more -- considering?" those who are performing will have taken the method very dangerous as a diet. If all the meals are made only into fruit, an energy scarcity arises in the body, and by having put up with other meals, stress accumulates and it may overeat shortly by the rebound. Have at most two meals, replace, recommendation that you eat normally as one meal. Fruit is foods for dieting which bring to a how-to diet and it requires. However, the one that weight decreases doesn't decrease when eating too much no matter how weight decreases either. The fruit is a faster speed if it contains sugar called fructose, is taken into the body. Do you think will happen if the energy was enough to take the required amount, right? It is taken into the inside of the body as fat; the fat is then transformed into a cause. So, even if it says you can eat as much as like delicious fruit, you will do diet in mind that the more just the good amount. Is the fruit diet right for you? You don’t have to stick to one fruit to keep the fat off. See how you can burn more fat without going to any extremes to get there. 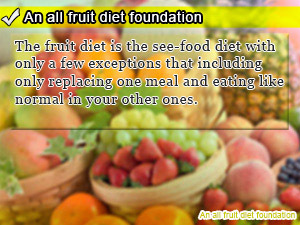 The fruit diet is the see-food diet with only a few exceptions that including only replacing one meal and eating like normal in your other ones. 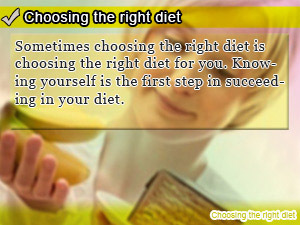 Sometimes choosing the right diet is choosing the right diet for you. Knowing yourself is the first step in succeeding in your diet. 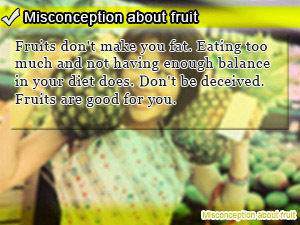 Fruits don't make you fat. Eating too much and not having enough balance in your diet does. Don't be deceived. Fruits are good for you.